There is perhaps no better-selling “enthusiast” or “power-user” smartphone than Samsung's Galaxy Note series. When it debuted in 2011, it was dismissed as ridiculous by many (myself included). It was too big, we said - too big to hold, “and for what? Who needs this?” many of us barked at the time (how wrong we were). 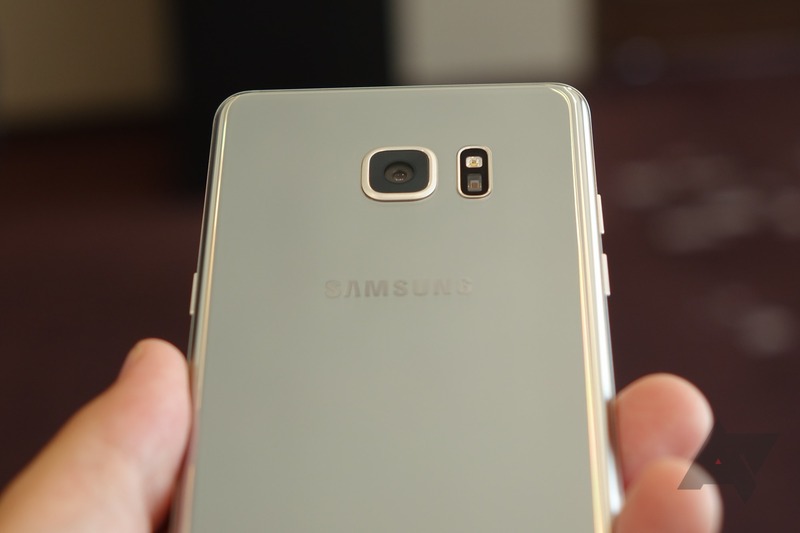 But the Note series became a runaway success, and each year, millions of Samsung fans await the latest iteration. 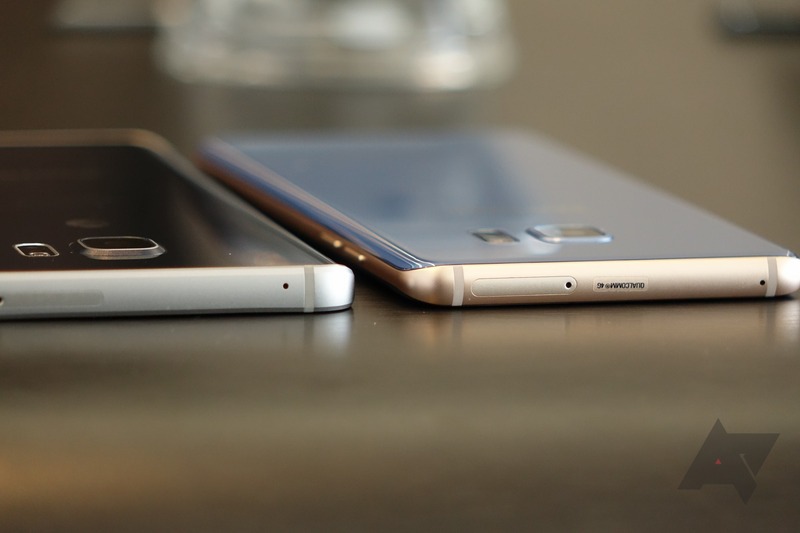 Last year’s Note, though, may have been the biggest letdown in the Note series yet. 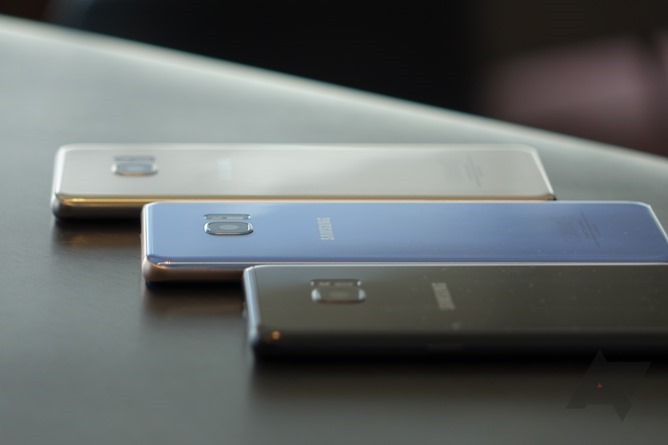 It had no microSD slot, no removable battery, and it didn’t even launch in Europe - perhaps a signal of the Note series entering a wind-down phase. A year later, does the Note still look like a smartphone lineage in its twilight years? I went hands-on with the phone two weeks ago to find out. Storage? 64GB is standard (it sounds like 64GB will be the only US SKU, too). 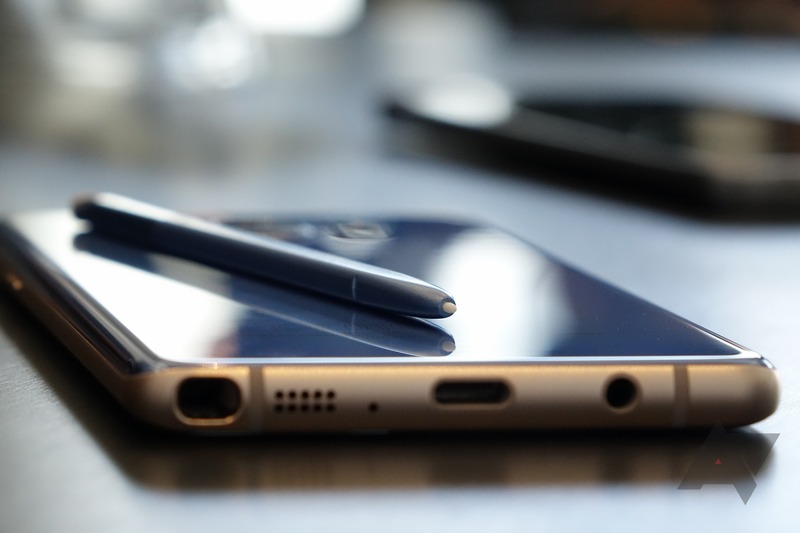 A larger 5.7” display provides more canvas than the S7 edge, though the stylus brings a battery compromise: at 3500mAh, the Note7’s battery is smaller than the S7 edge’s but powers a larger display panel. 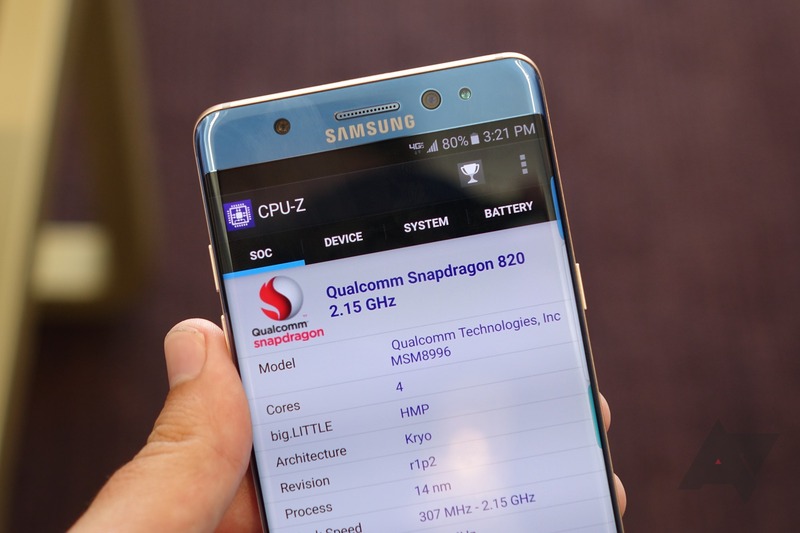 That could be less than ideal, especially considering the Snapdragon 820 S7 and edge variants have been well-documented as offering inferior battery life compared to their international Exynos counterparts (the Note7 will have a Snapdragon 820 in the US). 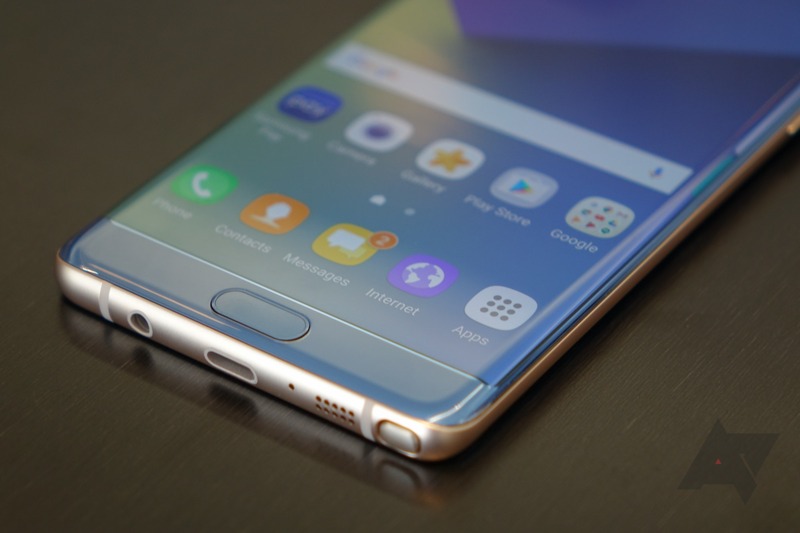 USB-C, a microSD slot, Gorilla Glass 5, a brand-new TouchWiz UI (and features), IP68 waterproofing, a redesigned and refined stylus, and Samsung’s toughest aluminum chassis yet, though, make it clear that the Note7 is a no-nonsense high-end smartphone. Oh, and Iris unlock is quite real - and it works. 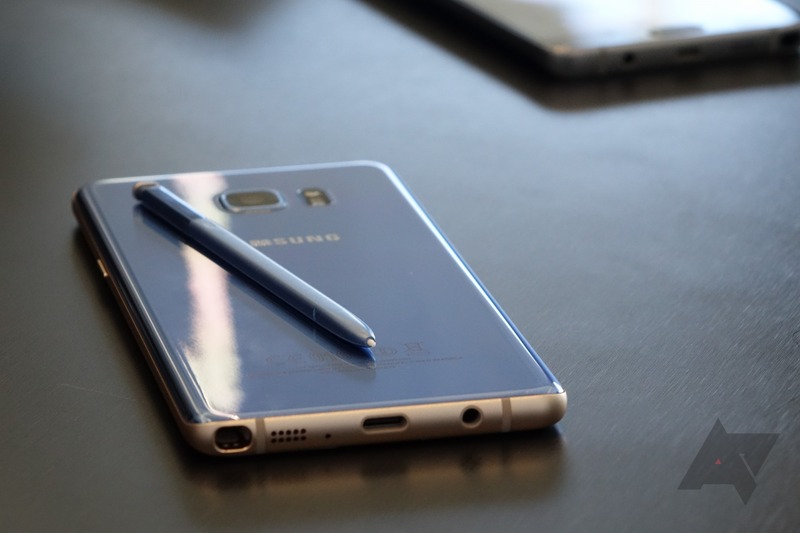 Immediately, picking up the Note7 makes you think of the Galaxy S7 and S7 edge: super comfortable to hold, a bit slippery, and clearly designed with an absurd level of precision and to insanely tight tolerances. 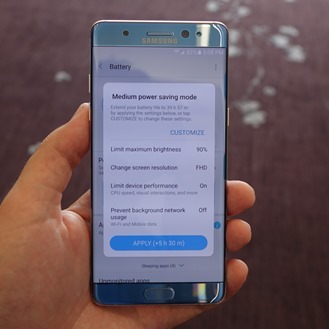 Samsung has, in my view, noticeably improved upon the S7 edge’s design in the Note7. 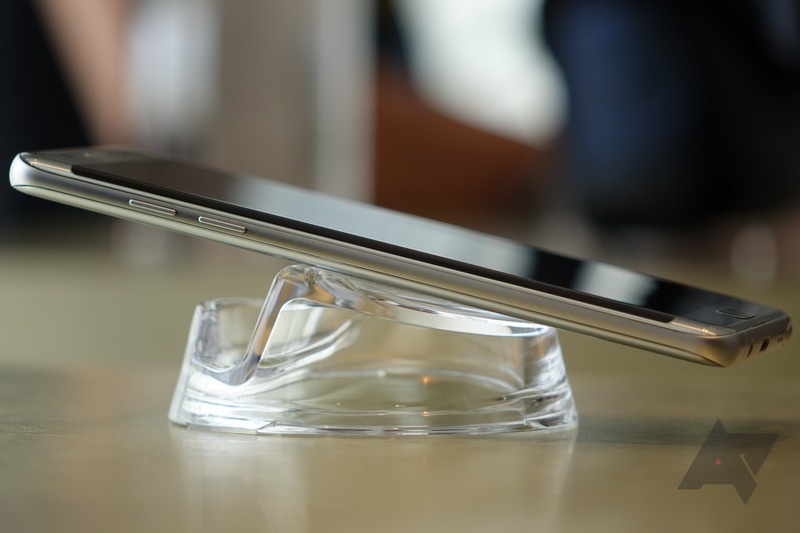 Even the frame around the phone is the company’s most durable yet, having made the switch to 7000 series aluminum. The new alloy gives it a smoother, softer feel. 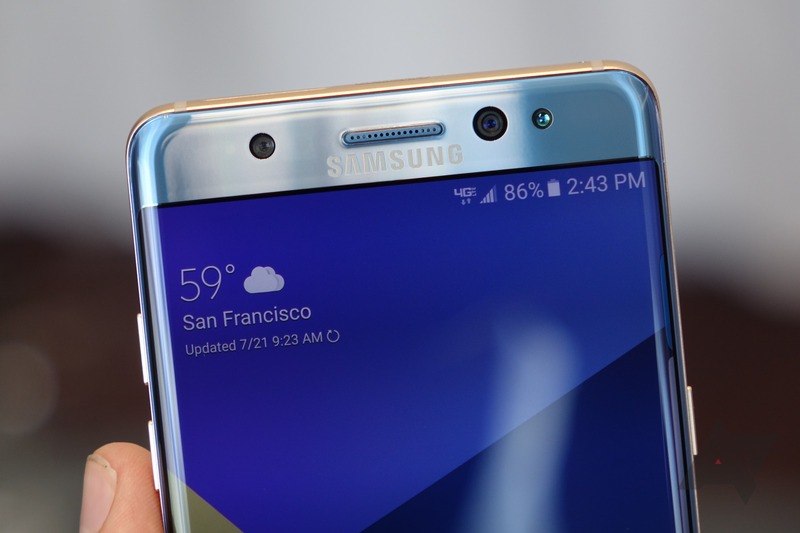 Samsung has continued to refine the "edge" display glass on its phones, with the Note7 having a gentler curve than the Galaxy S7 edge. The metal and glass meet almost flush now along the phone's vertical axis, so the transition is only vaguely apparent when gliding your finger over the edge of the screen. People like to talk about Xiaomi and other companies offering “similar” materials and quality to Samsung at a lower price, but… they’re wrong. 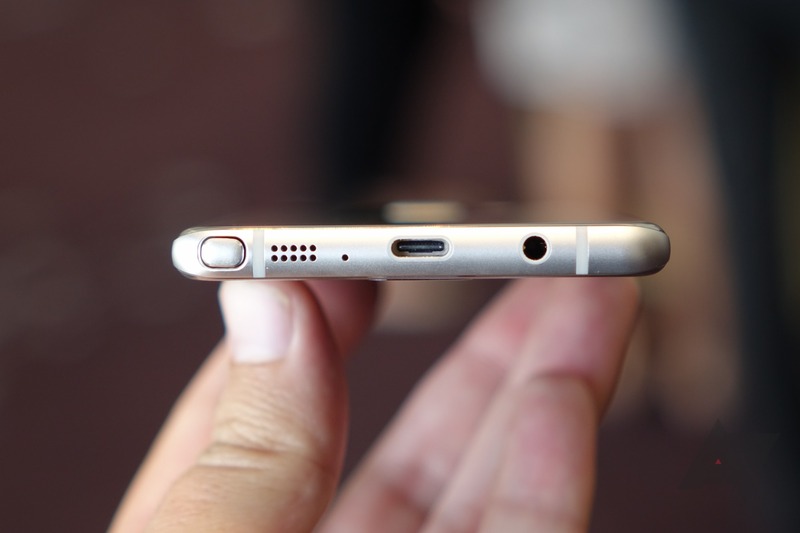 It’s the little details and the big picture that matter, and Samsung has both dead to rights. No odd sharp edges, no rough spots, no uneven gaps, and no odd proportions, inconsistencies, or fitment issues. (Granted, the whole “inserting the S Pen backward” thing did get by their engineers last year, but it's been fixed this time.) 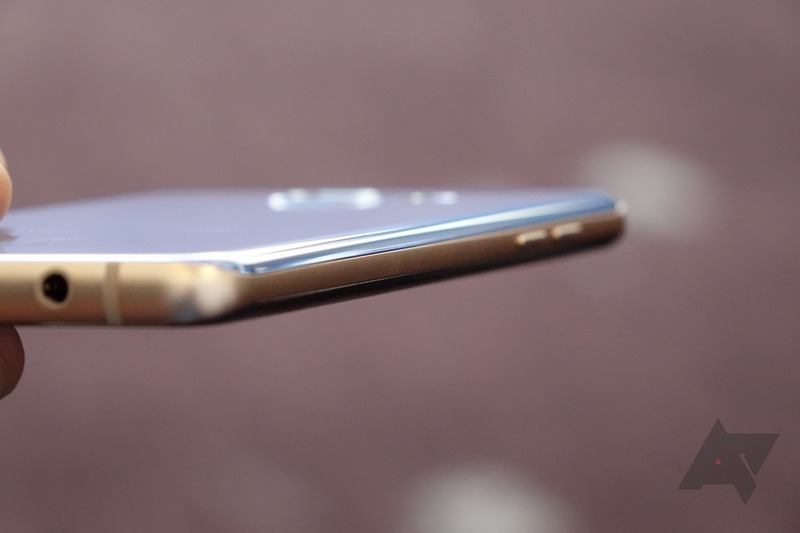 Samsung’s growing experience with curved glass and tapered design shows clearly: its latest phones are the most comfortable to hold of any device I’ve ever used, and the Note7 sits atop the pile. Whether the end aesthetic lands with you is entirely subjective. 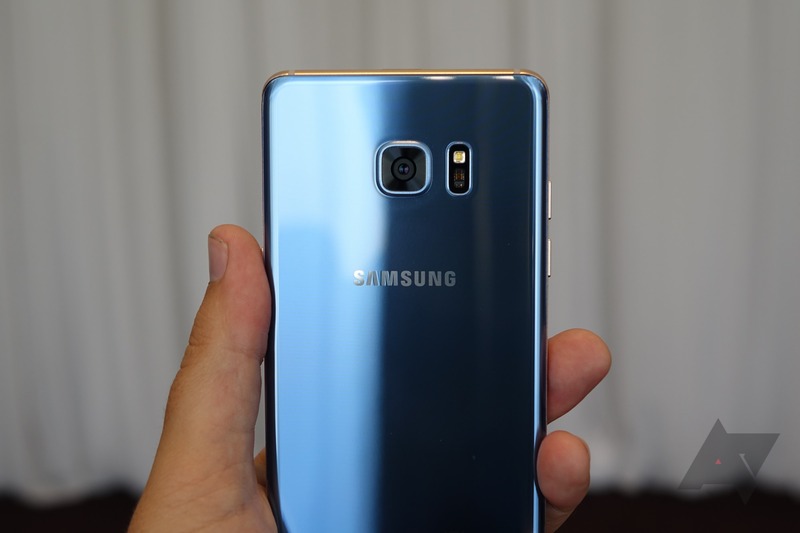 I, for one, find the new Coral Blue shade Samsung is introducing this year to be absolutely stunning in person. 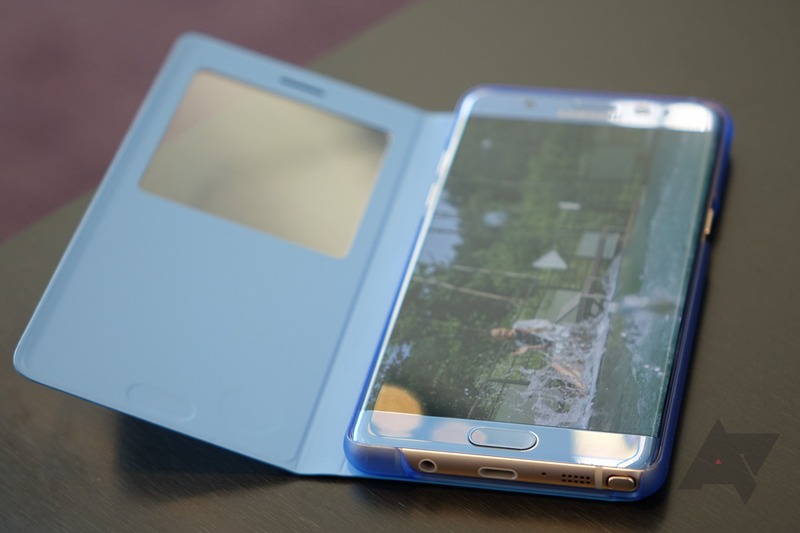 It really is a great color, and Samsung has accented it with a slightly orange anodization on the aluminum frame. The orange is subtle, but once you see it? It just works for me. I want all the blue and vaguely-orange phones. But you’re probably tired of hearing me wax poetic about the design - let’s talk function. Iris scanner? Yep, it’s real. It works by flashing IR light through the notification LED and then using a dedicated secondary camera that detects IR light to analyze your retina for a match. Because the system is IR-based, it actually works best in near-total darkness, though I found it worked fine in the well-lit demo room. Samsung does admit that bright light and reflections can cause the system to be less reliable, and glasses and contacts in particular can cause issues in very bright, direct sunlight. But in my time with it, overall, I was shocked at how quickly it tended to work. You’ll have to develop some muscle memory about the appropriate distance to hold the phone from your face, but I think once you get that behavior ingrained, this is a reliable, usable way to unlock your phone. Now, is iris unlock faster than using the fingerprint scanner? In an ideal comparison, no. You have to turn on the screen for either feature to become active, and with the fingerprint scanner, your finger is already on the button at that point, so there’s no real contest there. And the fingerprint scanner works when you’re not holding the phone (unless you want to crane your neck over the phone so it can see your eyes), or when you’re holding it at your side. All this stuff seems obvious, right? 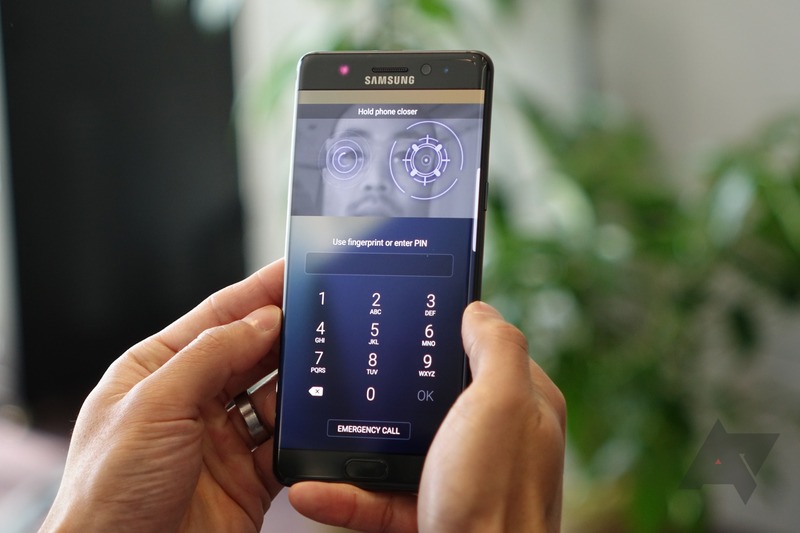 But I feel compelled to just point it out, because for as neat as the iris scanner is as a party trick, its practical advantages versus the tried and true fingerprint scanner are more limited. What are those practical cases? Using your phone with gloves. When your hands are wet. The other potential advantage? Enhanced security. Because the system relies on IR light, fooling it with a simple printout or an image of a pair of eyes is extremely unlikely to work. And you can’t “copy” someone’s iris like you can a fingerprint off a glass or surface, obviously. So the iris scanner theoretically offers better security in some respects (it can be set up with one eye, if you're missing one, by the way). It’s also kind of cool, but I tend to think I’d tire of it soon in favor of fingerprints. You can even give the iris scanner UI fun little themed elements in the settings, so you can pretend you’re in the Matrix or Dragonball Z or something. It’s a bit bizarre, but in a sort of fun and silly way. 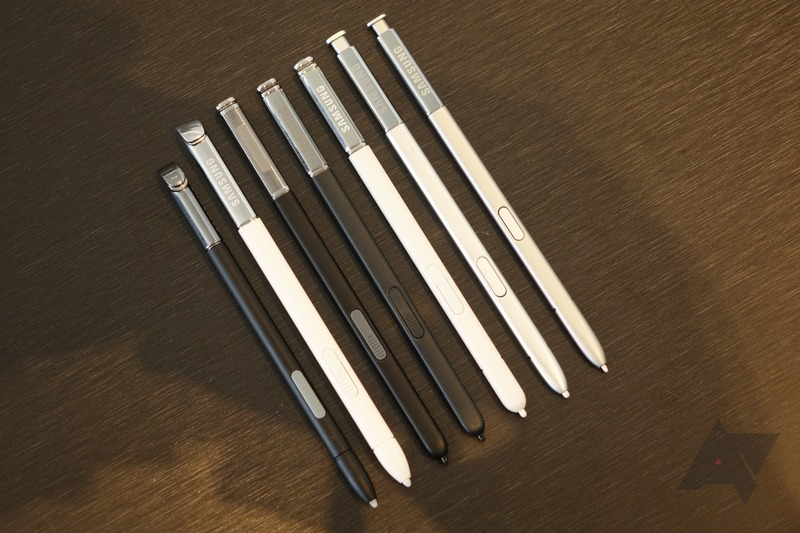 The S Pen has seen changes, too - it’s now thinner and lighter and with a smaller, more ball-point like tip. Samsung seems to have claimed every Note to date offers the most paper-like writing experience ever, so I’d take all those alleged improvements with a grain of salt. It’s still just a plastic stylus with a button, frankly. There’s a new feature that lets you highlight videos on the screen with the pen and then turn them into animated GIFs to share. 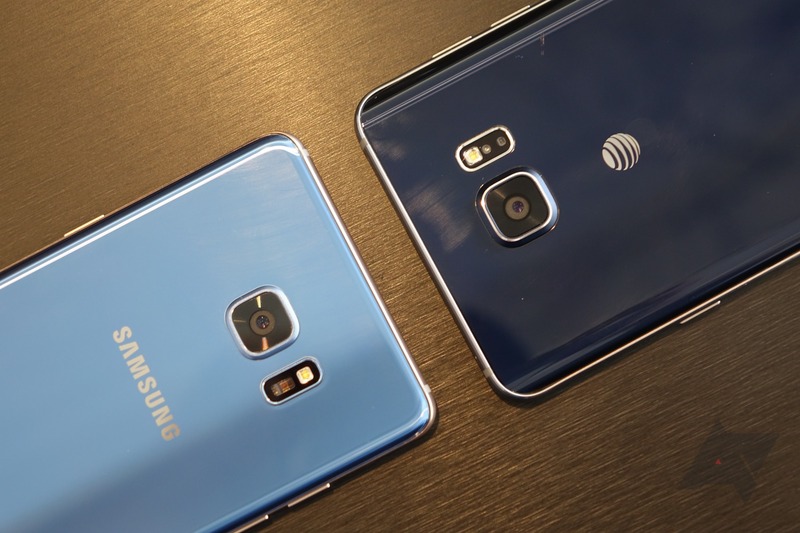 Which, OK.
Rounding out the hardware, the cameras are the same ones you’ll find on the S7 and S7 edge; the same Snapdragon 820 processor (and the same Exynos in markets outside the US), the same quick charging speed (granted, now via USB-C), the same wireless charging, the same RAM, display, and UFS storage (with twice the capacity). The Note7 is, in most respects, a slightly updated Galaxy S7 edge from a hardware perspective. You add the stylus, the iris scanner setup, 64GB of storage, a slightly smaller battery, a larger display, and the USB-C port - that’s about it. Samsung will even sweeten the pot with either a free Gear Fit2 or a 256GB EVO microSD card with each phone (your choice), at least here in the US. On the software side, TouchWiz has received a very substantial visual update. Everything from quick settings pull-down to the camera app has been touched, and there is a lot more white going on in this new UI. To be honest? I’m not the biggest fan based on my initial experience, but that may change with more use. 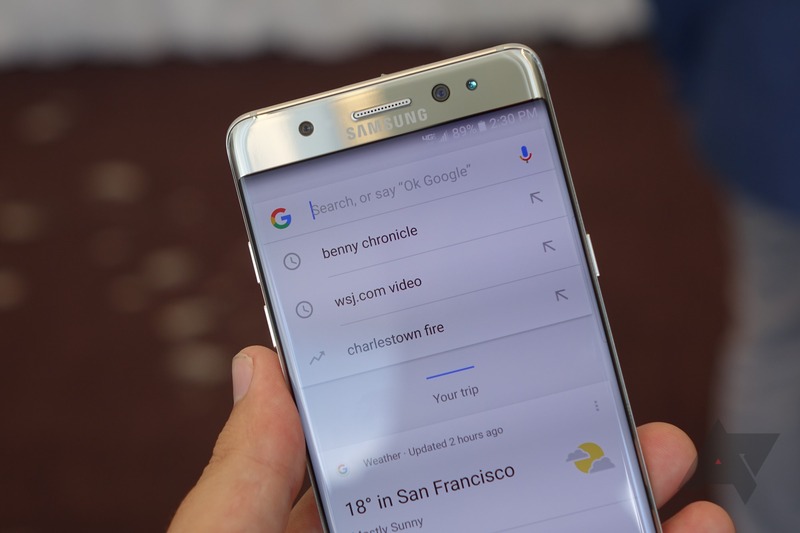 I actually didn’t mind the version of TouchWiz Samsung shipped on the Galaxy S7 - this latest overhaul feels like an odd pivot to make. As for new features, Samsung’s new color-shift mode to reduce the luminosity blue pixels at night works very well, and it’s fairly tweakable. There’s a whole new set of functions built around privacy that allow you to sequester copies of apps (which could be signed into different profiles, for example) behind a secure authentication method, like the iris scanner. You can also use this new system for files and photos, of course. 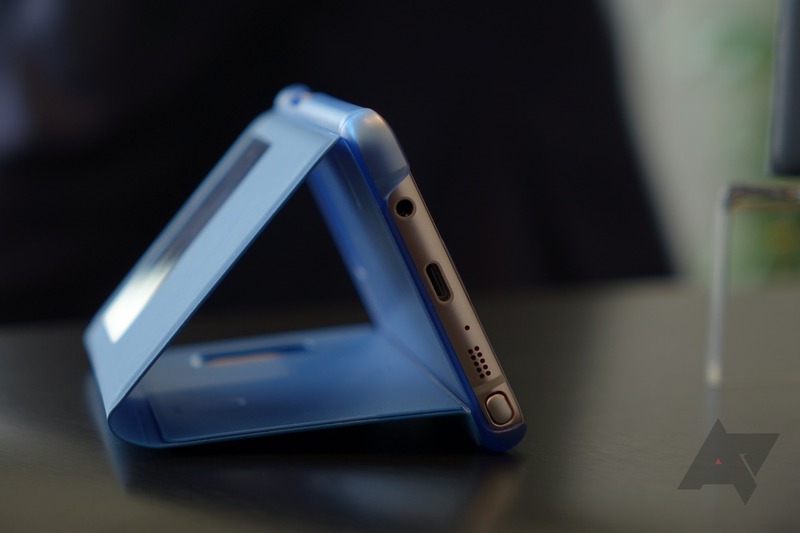 Such features are increasingly common on Chinese smartphones, so it’s interesting to see Samsung pick up on this now. 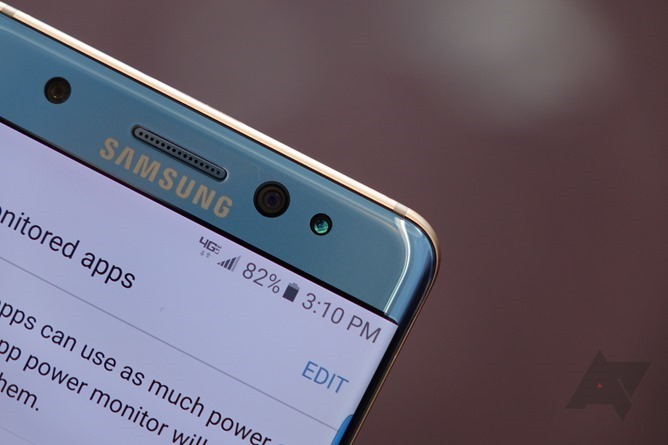 TouchWiz’s power saving features have been greatly enhanced, even allowing you to reduce the rendered resolution of the operating system to save power - these new modes are quite interesting, and offer a level of customization on energy consumption that few phones I’ve ever used do. I don’t want this hands-on to turn into a review, so I’m going to wrap it up here. 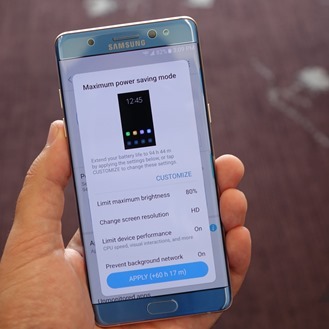 Based on what I saw in my somewhat-brief time with the Note7, I think Samsung has crafted a winning formula for fans of the Galaxy Note series - at least those not bothered by a non-removable battery. 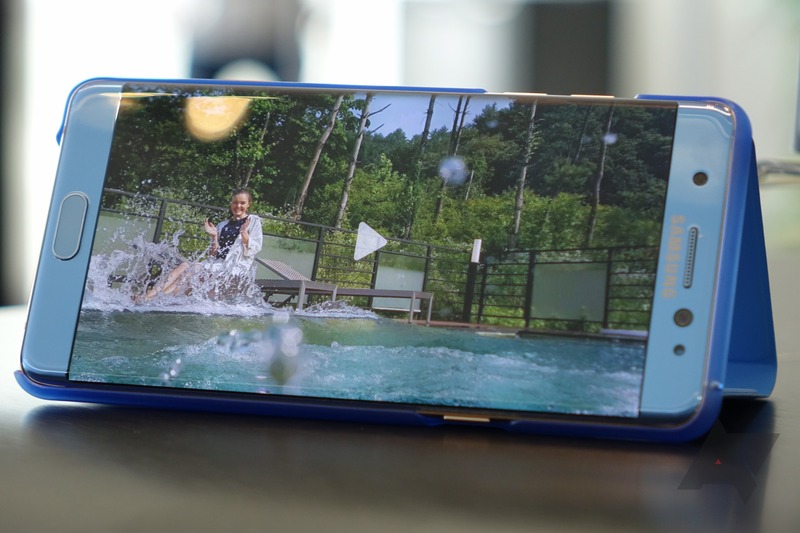 Unlike last year’s Note 5, there’s a microSD card, you get water-resistance, and Samsung has finally gotten on board with USB-C. 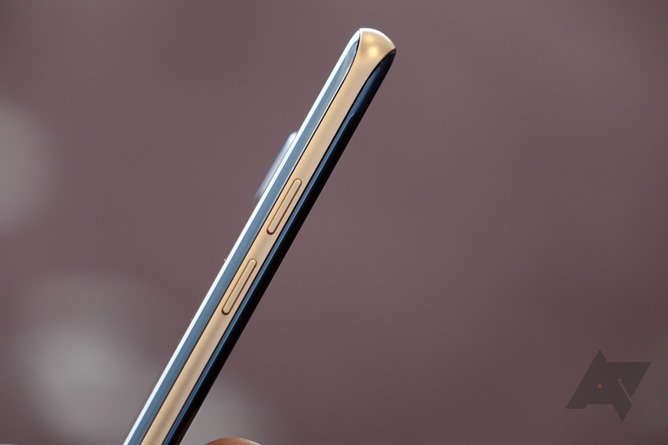 The stylus does seem a bit more short-changed than average this go around in terms of new features (Samsung talked a big game, but I really don’t see anything interesting about the improvements they’ve made), which is probably telling: it remains largely as a legacy feature for those who won’t buy the phone without it. 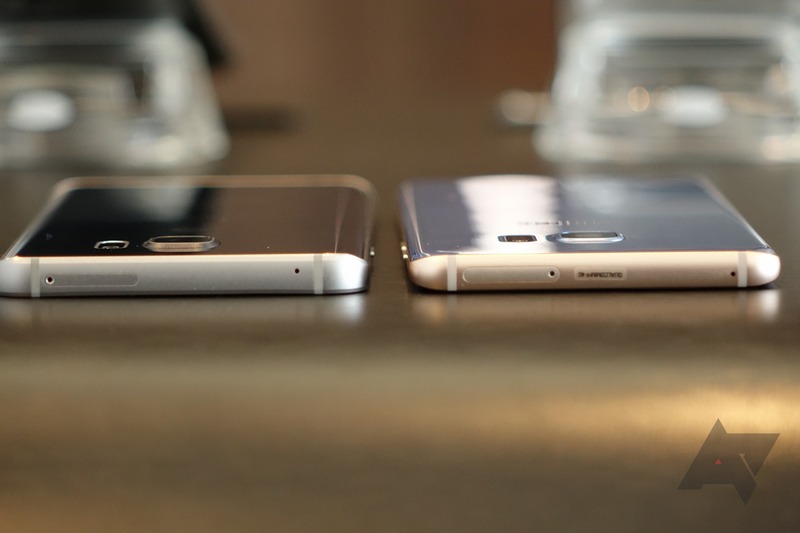 But if you want the biggest, best phone Samsung has to offer? 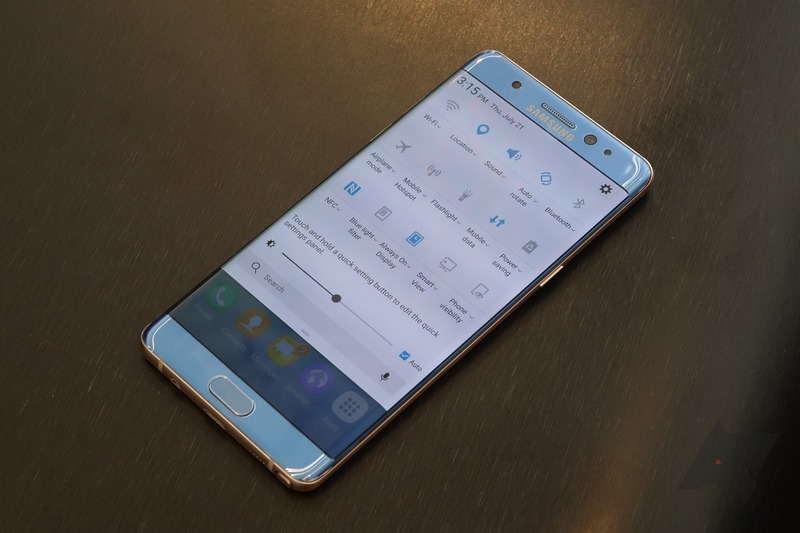 The Note7 will probably be it. 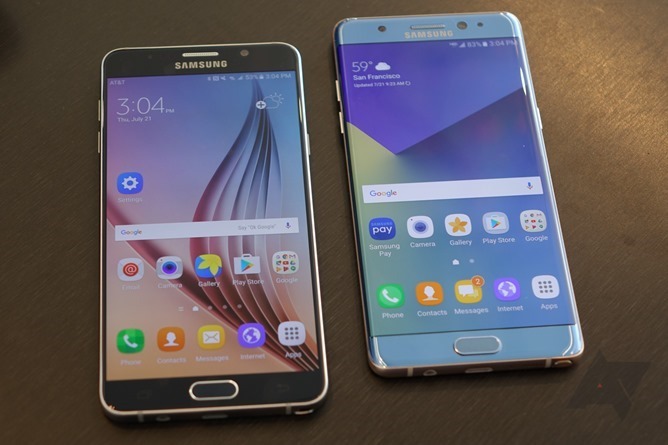 If you’re not on Team Samsung and are hoping they’ve done something to sway you that they didn’t with the S7 or S7 edge (aside from a slightly larger display)? There’s not much else of interest here over those devices.